Outdoor showers have plenty of benefits, especially for people who spend a lot of time outside. If your day of boating, beach combing, or hiking has left you grimy and sweaty, it's a good idea to wash off before heading inside, if only to spare your white porcelain tub all the sand, grime and dirt from outside. 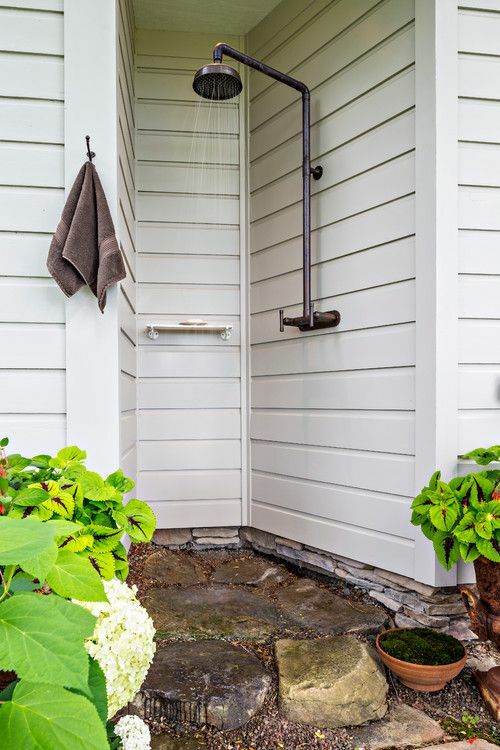 This outdoor shower to a house in the Hudson Valley by Edward Ira Schachner shows how you can use a small nook in your home's outside architecture to fit in a shower head. Simply extend the piping from inside so you don't need to install new ones. Outside doesn't have to mean visible to every neighbour... and their neighbours. This outdoor shower stall in classic white wood by Robyn Hogan Home Design gives you all the privacy you need while still letting you shower under a bright blue sky. The outdoor setting lets you use bigger, bolder hardware because you are not so limited by space. Cabins are definitely more comfortable than camping, but you can still get that camping shower feel by adding an outdoor shower stall to the side of the building. This fun, rustic outdoor shower by BeDe Design features stressed wood, towel hooks, and scrubbing items hanging from the shower head. It can also easily serve as an extra shower for when you bring a few extra guests for the weekend. Are you worried your more glamorous tastes are not compatible with the ruggedness of an outdoor shower? Think again. This beautiful outdoor shower by Urban Grace Interiors uses the bright white of the outside wall to set off a green stool, and heavy curtains provide privacy. Modern jets and temperature control ensures that you get all the same comforts as inside. Sometimes there are too many people around to change comfortably to take an outdoor shower. If that is the case, add an extra changing stall for everyone's comfort, as in this natural wood outdoor shower by CRISP Architects. That way, you and your guests can switch from swimming suit to evening-around-the-fire clothes without having to run inside. The beauty of an outdoor shower is how you can use the natural landscape to decorate without much of a fuss. This gorgeous outdoor shower by Erin Michael Design uses the climbing vines for greenery and color. A sliding glass door connects this outdoor space to the bathroom inside, which still maintains your privacy whether you are inside or outside. Square, right-angled shapes take centre stage in this mid-century outdoor shower by Todd Hamilton Architect. Eco-friendly homeowners take note: you can use an outdoor shower to reuse your grey water effectively in your yard, without needing to add a new drainage system to separate your in-house grey water to black water. Here's a handy primer on how to conceive a grey water system for gardening and landscaping. Expand your small indoor powder room with a large outdoor shower, as in this traditional outdoor shower by Walter Powell Architect. The shingled walls keep the whole harmonious, while a teak wood deck drains water effectively down to the ground. The connection to the indoor bathroom keeps things private, too. Clean off after a day at the lakeside beach using this practical outdoor shower by Robert Young Architects. The temperate climate means that the shower must be dismantled in the winter, but in the summer, you can enjoy all its benefits, including washing off the sand from your toes and hair. It's not so big to take over the deck, but big enough to fit a person comfortably. This cute little shower cubicle by T.S. Adams Studio can easily be added to any home. Just use the same or a similar siding from your house exterior, and run some pipes to the desired showering area. This particular stall could use some hooks for clothes and towels for more practicality, but is otherwise a great use of space and architectural features. Do you sometimes wish you could take a warm bath during a cool summer night, watching the stars above? Well, with this outdoor tub-shower combination by Sharon Barrett Interiors, it's finally possible. This area is outfitted as a full outdoor bathroom, complete with mirror and bath rug. Just make sure to protect your tub properly from the elements. Here's an example of an outdoor shower with a fun flooring choice. This outdoor shower design by Patterson Custom Homes uses the same color as the home exterior, but differentiates the shower space using a pebble floor. This gives it a natural connection to the exterior landscape. The door lets you quickly enter the house after showering. Until now, we've seen a lot of showers that melt in the background, usually using the same color and pattern as the home exterior. However, this one design by Bill Fry Construction does things differently: it uses a separate set of tiles to demarcate the shower area. This adds visual interest and actually displays the shower as an architectural feature, rather than a hidden addition. The vintage look for bathrooms isn't limited to indoor spaces. A vintage rain shower sets this large outdoor shower, by Upscale Construction, apart from others. The matte black hardware contrasts the light grey teak flooring and siding, but keeps everything monochromatic: a harmonious choice. A bench just out of the shower range keeps your towel and clothes dry. The tuscan tile truly sets this outdoor shower by Kathryn Shaffer apart from others. The tiling serves as a gorgeous architectural feature for the house's exterior and uses traditional Mediterranean colors like yellow and blue. If you had that attached to your home, wouldn't you want to take your shower outside every day? Dreamy Bathroom Ideas: Which Is Right For YOUR Home? Prefab vs Tiled Shower: Which Is a Better Choice?